Who doesn't love to colour? As an adult, now that you can stay in the lines, you only need to think about what colour to use! Rockport Books presents a series of grown-up colouring books for art and design lovers. 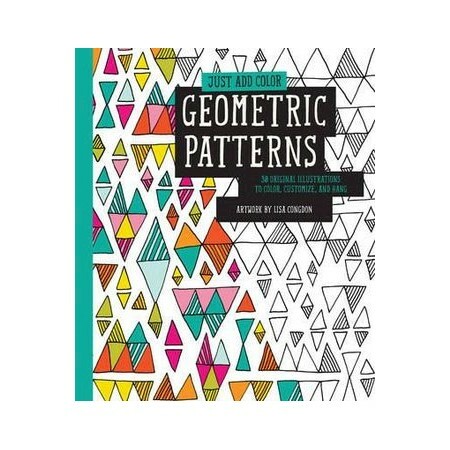 Just Add Color : Geometric Patterns includes 30 original designs from artist and illustrator Lisa Congdon. Each book contains 64 perforated pages to make it easy to share, frame and hang your artwork. You'll be inspired by the sumptuous artwork in this book, and the use of colour is endless. Relax, enjoy your creativity and Just Add Color. San Francisco illustrator and fine artist Lisa Congdon was raised in both upstate New York and Northern California where she grew to love the trees and animals that surrounded her. That love is now expressed through her paintings and drawings. Lisa is predominantly self taught and did not begin painting until she was 31 years old. She is also a prolific collector of old and unusual things and surrounds herself with these things in her home & studio. In 2010 she chronicled her collections in her Collection A Day 2010 Project. That project is now a book, published in March 2011. In 2012, Lisa engaged in another daily project called 365 Days of Hand Lettering, 100 of her hand lettered quotes from that project published by Chronicle Books in Spring of 2014.